My simple starting method is to put the seeds on a wet paper towel then into a baggie and into a warm area like over fridge. I really like how I can detect dud batches early this way, instead of waiting waiting waiting. I do this as well and really prefer it to the sow and wait. I plant several hundred pepper and tomato seedlings that I give to the PTA at my kid’s school for the Spring plant sale, and this let’s me sow only one seed (already sprouting) per sell and make my seed stock go a lot further. I can’t afford the space under my lights for a lot of empty cells. My biggest challenge with this method is sometimes getting busy and waiting too long or just having a variety or 2 that starts really quickly and suddenly I’ve got these long tender roots weaving into the paper towels. I’ve learned I better check them every day. @dimitri_7a I also start greens inside in 200 cell trays (sometimes 72 cell trays). That way I don’t have to worry about them drying out, etc. after sowing since most of my veggies are grown at a community garden plot which makes it harder to monitor. Also, with limited space, I find I prefer the exact spacing I can get with the greens as individual plugs vs. seeding a row and hoping I get the right distribution. I haven’t compared time to maturity doing it this way vs. direct sowing, but I’m mostly concerned with the spacing and timing. Quick question about supper hot pepper seeds for anyone who knows. One vendor sent me a bonus pack of some crazy hot peppers and I figured I’d go ahead and start them for the PTA sale (I sure can’t handle the heat!) - they are called Brown Bhutlah. I know people where latex gloves, sometimes even doubled up, when seeding these things, but should I be afraid to touch the seeds now that they’re dry? I’ll try not to handle them too much, but wasn’t sure if I should worry about touching them at all. I know people where latex gloves, sometimes even doubled up, when seeding these things, but should I be afraid to touch the seeds now that they’re dry? I’ll try not to handle them too much, but wasn’t sure if I should worry about touching them at all. I don’t think you have to worry about getting burned by touching dry super-hot pepper seeds. I’ve handled and planted them bare handed and have never had a problem. I’m planting Habanero, jalapenos, 7-pot and Bhut Jolokia this year along with other peppers. It’s when you cut up the actual peppers that you need to take precautions, like gloves, and maybe some kind of eye protection. I have a bunch of nitrile gloves, and have to double up on them when I’m slicing them up. Oh, and if you cut them up indoors, it helps to have good air circulation, as the fumes can get a bit overwhelming sometimes! 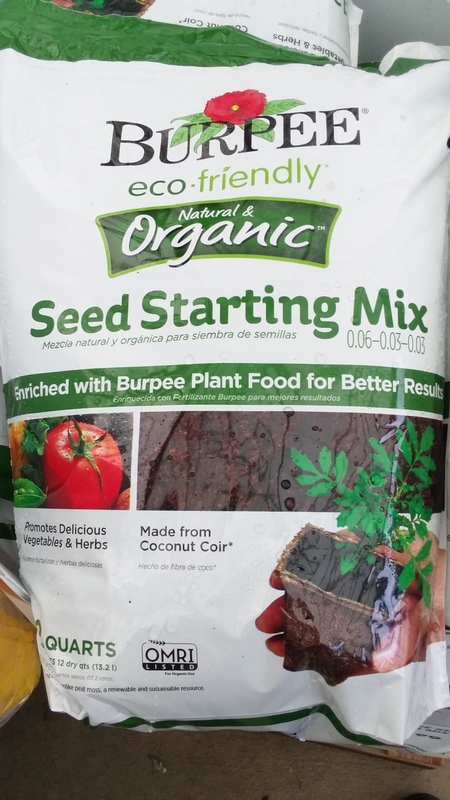 Found this new starting mix at Lowe’s last week. I think it’s what I’ll be trying this year. I usually use some kind of peat moss type of mix, but have had some issues with peppers not germinating. Maybe it’s the acidic nature of the peat that causes this? 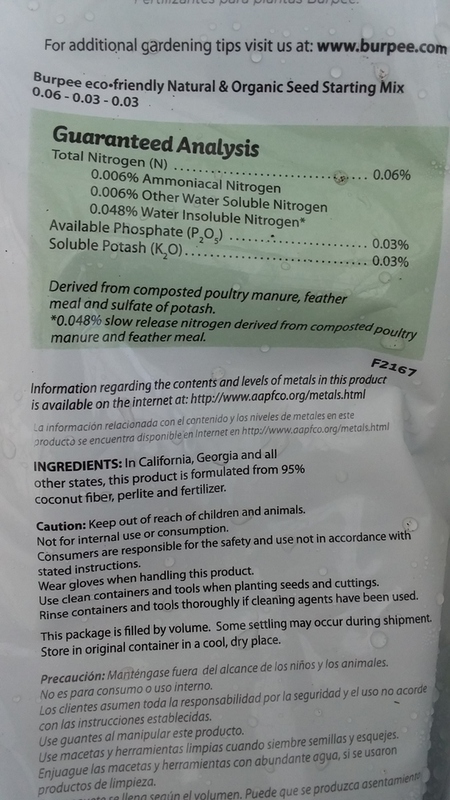 This mix is coconut coir and perlite, with minute levels of fertilizer. A 12qt bag costs about $6, if I remember correctly. Anyone have any comments or experience about using coir as a starting mix? What about as a potting mix for container/pot growing? I planted onions and peppers last week in that same starter mix. The peppers are starting to sprout after 6 days on a heating mat, as are the onions. Pepper seeds don’t keep as long as some other kinds of seeds, but are good for at least two years if in a ziplock or covered plastic bucket in the fridge. Since this thread is about how we start our veggies, I thought I’d post my procedures. In the past I used Jiffy peat pods, which were in little biodegradable netting. These were put in a 72 cell tray, and then water was added to the pods to allow them to swell up. Then the seeds, usually 2 or 3 were added. These trays, usually two, were placed on heat pads and a clear plastic dome was placed over them to trap the heat in. When I got a few sprouts, I lifted up the tray a bit to get some air in there. When most of the tray had sprouted, I removed the heat pads, and put my 4 bulb T8 light fixture (suspended by chains) down near the trays and raised it as the plants grew. 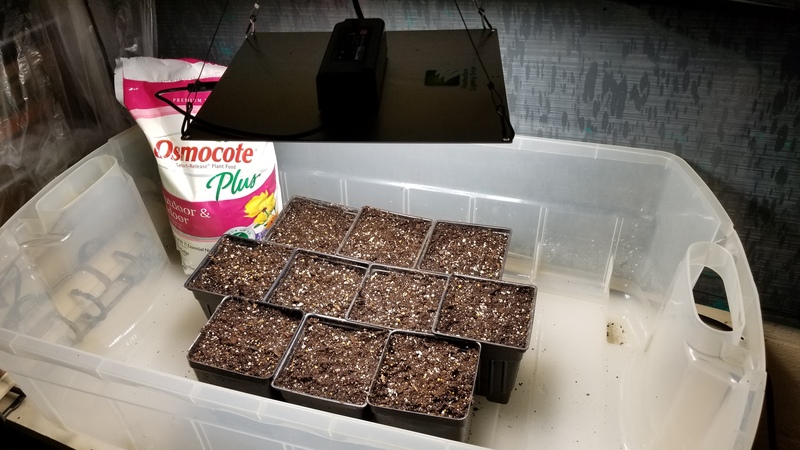 When the seedlings got to about 3in tall and I saw some true leaves, I transferred them to 10oz red drinking cups with holes punched in the bottom. I cut away the netting and placed them deep in the cups and filled it almost up with potting soil. Then they went back under the lights until they got a bit bigger. As the weather warms and dries outside, I’d harden them off by setting them outside a few hours a day, first in shade, then more sunlight. After a week or so, they’re ready to go into the garden. I still do it this way except I went to 72 cell hex pods and a seed starting mix as the Jiffy pods became a pain. For my seed starting mix this year I’m trying this coir and perlite mix shown earlier. Since we’ve had bad results with direct sowing greens in the past, I think we’ll try starting them indoors this year. This includes lettuce, cabbage, broccoli, chard, herbs and spinach. Okra, cukes, corn, radishes and onion sets get directly sown when the ground’s warm and dry enough. Thanks, does it seem to hold water pretty well, or do you have to worry about it drying out quickly? Regarding pepper seeds, I sowed a bunch of jalapeno seeds last year, and none of them came up, so I guess they were a bit too old. I bought a new pack for this year. Last year a saved a bunch of pepper seeds from some stuff I grew, so I’ll be trying those out this year. Some super-hots but some others we like like Beaver Dam and Ancient Sweet. When I was sorting my seeds a few weeks ago I came across an envelope of hot pepper seeds someone had sent me. They had a couple pieces of hot pepper in the envelope. In a few minutes my eyes were watering and I was sneezing like crazy. Those must have been mighty hot peppers! I usually don’t grow hot peppers. Last year I grew one jalapeño and it produced about 10 x more than we needed… its not worth the space. Hey @dimitri_7a I thought you might like to see my new setup - I got the light and fertilizer you recommended. I hope I get healthier seedlings this year. Last year I bought the jalapeño as a plant from Home Depot and it was much greener and more vigorous than the peppers I grew from seed… it made me realize I was not fertilizing or lighting enough. Hopefully this year is better. I started things early because I am going to be grafting my tomatoes for the first time. Maybe a little too early… The seeds in the above are all going, I started them in paper towel baggies; all were good seeds except some peppers; even my 10-year old Sungolds sprouted. A few are starting to pop their heads above the dirt now. Holds water fine. Last year we were traveling, so I actually started my seeds in flats taped to the dash of our motor home! It worked fine. Looks great! I think you will be very happy with the dense growth you get with these lights. One thing to note about the Osmocote is that it doesn’t contain calcium so if you use it in containers you should also add some bone meal or similar. The seedlings will probably get plenty of calcium from tap water - I only noticed the deficiency when I started getting blossom end rot. Very much hoping you will post updates / your end results. this is what i use and i add a couple handfuls of worm castings to the bag as well. helps prevent damp off. when the seedling rots at the soil level. caused by a bacteria that worm castings helps prevent. Did you have to fertilize the seedlings after a certain matter of time? Did you have good germination with the mix? My tomatoes get WAY too big if I start them any more than about 4 weeks ahead of planting date. Is anyone else starting spinach inside? I admit, I pretty much do this for something to do, but have yet to perfect the method. They are such spotty germinators. For example, out of 36 plants I started on Feb 3, two have full cotyledons, two have just started coming up, and nothing from the rest. There are brand new seeds at about 65 degrees. If more don’t come up in five days, I will sow more seeds. For insurance I put some spinach seeds in a wet paper towel inside a sandwich bag. I’ll see if this works any better. The good news is I went out and checked my hoop house today and all the spinach and Russian Kale I planted in the fall is still growing and should be good to start eating again soon, hopefully the beginning of March. My stuff said to sow spinach direct in the ground. I am zone 8b though and yours may be different. I did plant seedlings for Kale indoors today though…good luck! I planted some spinach outside one year in a sandy area in my orchard. It didn’t come up. The following year it sprouted there! Is anyone else starting spinach inside? Although I start most greens inside, including kale, chard, etc., I have given up on Spinach. I do okay on germination, but anytime I’ve tried it, the spinach has bolted at a tiny size. I think the slight increase in heat under the lights, lack of cool nights because they are inside and long photoperiods I use, trigger it. So I just direct sow. But I will be growing perpetual spinach (actually a chard) this year and will start seeds inside as soon as they arrive. @BG1977 yeah, I will admit that they get to about 10" tall and 6-8" wide. But it works for me because I plant them extra deep in the ground.